Having on-site lodging is a sure-fire way to take your property to the next level. Look no further than Erin Hills, host of the 2017 U.S. Open as a hallmark for this blueprint to success. Created three years after opening in 2006, Erin Hills' collection of cabins has been so popular for stay and play guests, the course received visitors from all 50 states and a dozen countries in 2014 alone. 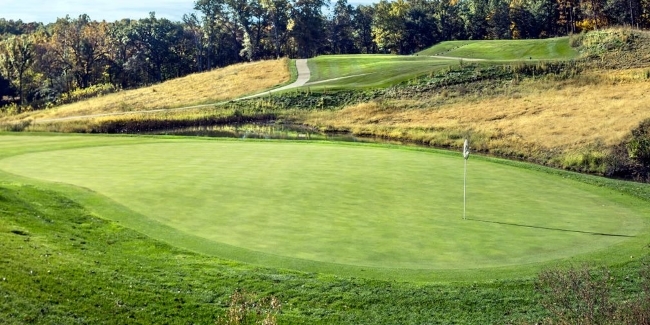 Five hours south of Erin Hills resides Spirit Hollow GC in Burlington, IA, currently the number two ranked course in the Hawkeye State according to Golf Digest's most recent Best-in-State ranking list - ironically the same ranking that Erin Hills has in the Badger State. Spirit Hollow's three spot jump from five to two is a definite source of pride for General Manager Jim Wyffels, and comes at the perfect time for the property to debut their on-site private golf rooms dubbed The LODGE at Spirit Hollow. "Our plan at Spirit Hollow is to create a destination golf experience that will bring golfers from the local region and beyond. The LODGE component will allow us to give golfers a first class private lodging and dining experience that will complement our wonderful golf course. We put a great deal of time into the planning and layout of our lodge, combining high end finishes with amazing views of the golf course," concluded Wyffels. Simply stated, the newly minted LODGE at Spirit Hollow is the ideal destination for travelers who simply want to unwind in an idyllic setting. The LODGE is perfectly designed for golfers, romantic getaways, a girls or guys buddies weekend, and corporate meetings. The "if you build it they will come," montra has already worked in Iowa once before, and while this one has nothing to do with Hollywood, your golf group will feel like movie stars when on property. The LODGE features a private dining room and a welcoming social area in which to relax, including gaming tables, TV's, complimentary Wi-Fi, comfortable leather chairs and a roaring fireplace. Add your favorite beverage, great friends, and your version of what happened on the course earlier that day, and you have all the makings of the perfect stay. Throw in dramatic views overlooking the golf course, and you'll need to count birdies just to fall asleep. Ah, the golf course . . . the success of Spirit Hollow as a first-class destination since 2000 is the reason The LODGE at Spirit Hollow was erected. The Richard Jacobson design plays a bodacious 7301 yards from the tips and should come with a warning label and a mulligan per side option. The Black Tees (6,580 yards, rating of 71.4) provides a stern, yet fair test of golf, while the White Tees (6010 yards, rating of 69.0) is the ideal place for most double-digit players. No matter which set of tees you attack from, Spirit Hollow's first three holes set the stage for an exciting round. The opening tee shot calls for a draw around the corner of the dogleg which leads to a sunken, slippery green. The 507 yard par-5 2nd is a sheer delight, as the golfer must fit his or her tee shot between bunkers right and water left - again a subtle draw is the optimum shot here. Finally, the 141 yard par-3 3rd may be the short side, but it is definitely not the easiest. Your approach shot is played entirely over water to a green that seems to repel non-perfect strikes. The journey then continues through Burlington's only gated community on holes six through eight and then offers a "what did I get myself into moment" at number nine. 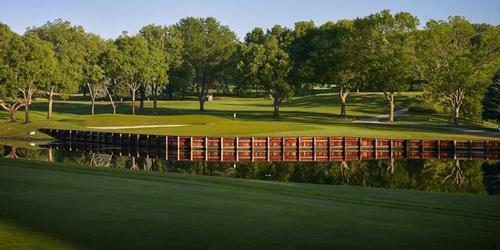 Although only 365 yards from the Black Tees, length has no determining factor on your final score. Whether you are able to hit a postage stamp green with a short iron will determine your fate! There is no bail-out area at number nine except short and right and even the most conservative double lay-up must clear the water! Alan Miller, Spirit Hollow's Assistant Head Professional, believes the approach shot to No. 9 is the best on the course. "Picking a target and being confident is a must to reward a well-placed tee shot," explained Miller. All in all, the 9th is a stunning capper to the outward nine at Spirit Hollow and a precursor of more golf glory to come. There are too many brilliant holes on the back nine to describe here, as the course turns to the outer reaches of the property and away from the gated community after the tenth. My two personal favorites include the 393 yard, par-4 14th, which once again requires a precise draw from an elevated tee. The green complex bends up and to the right and only reveals the top end of the stick from the fairway. No hero shots allowed here, play for your par and scurry to the next. Spirit Hollow's finishing hole is an outstanding birdie chance - if you are willing to bomb your drive over the winding Spring Creek that meanders allow and through the fairway. The 521 yard par-5 is straight out of Valhalla CC, home of last year's PGA Championship, with trees and high mounds framing the entire journey. Since water must be traversed to get home in two, the numbers you've carded on the first 17 may dictate your decision on this bold closer. Thanks to this outstanding collection of holes, superior service, and top-notch amenities, Spirit Hollow has hosted nearly every major tournament in Iowa during its 15 year history. "Our reputation as the host to many state qualifiers and high profile tournaments has drawn many local outings and events to Spirit Hollow and I look forward to using my connections to continue that tradition," stated Greg Mason, Spirit Hollow's new Head Golf Professional. "I am looking forward to complete the vision of making this facility No. 1 in the State and Top 100 in the nation. The LODGE, Stay and Play, award-winning course and the new G.G. Conn Pavilion are all a part of our upward movement here," explained the Northern Iowa alumnus. In conclusion, Spirit Hollow's impressive resume has been bolstered by the addition of The LODGE and a new pavilion that overlooks the practice facility. Top five course in state - check. On-site lodging - check. Off the charts amenities - check! Now that is a blueprint other properties can emulate. For more information on all that Spirit Hollow has to offer, visit their website at www.spirithollowgolfcourse.com or call their pro shop at (319) 752-0004.